This is a certificate program. SchHI dogs should get the certificate without extra training. The certificate states that the trainee is alert full. Trainees that haven't received Schutzhund training and that are to be watch dogs will enter this program. Training consists of area protection work and will learn which situations are to be referred as a threat and what reactions he/she must show. 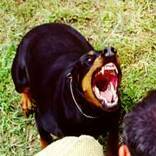 These dogs that will guard the home or workplace are expected to not show aggression when unnecessary. Training continues for between 10 and 20 days.